New Batch Sweep for the Enterprise Edition allows advanced statistical true portfolio optimization procedures ! Compuvision produces advanced system testing and development tools for traders who use Metastock® and now BullCharts as well as a number of other popular charting packages. We have a number of products which significantly extend the functionality and analysis capability of Metastock, and other charting software, well beyond competing products irrespective of price. These products are unprecedented in their ability to thoroughly analyze and objectively evaluate any trading system and will greatly reduce the probability that you will begin trading with either an unprofitable strategy or one that does not meet your expectations. The Trading Analysis Software of choice! With a large worldwide user base, ranging from private traders to fund managers TradeSim is fast becoming the standard by which others are judged. TradeSim fills the void left out by so many charting packages. This is because our software, has, and is continually being shaped by our customers needs for which their invaluable feedback has greatly spawned the development of this product since its inception. When you purchase TradeSim you get more than just an outstanding product; you get after sales support; ongoing research and development, and free distribution of future upgrades. Unlike some other software vendors we actually listen and react to our users needs which is why we have so many satisfied customers world wide (see user testimonies). Aimed at Traders and not Computer Programmers! Not only is TradeSim a powerful development and analysis platform that should be incorporated into every traders arsenal, it also addresses an important issue that is ignored by so much trading software these days - and that is its simplicity of use. These days so much trading software is written for computer programmers and not for the less computer literate trading community who's main concern is to focus on their trading system and not the idiosyncracies of the software or it's language. TradeSim addresses these needs by providing an intuitive streamlined user interface whilst not compromising on performance, power and flexibility! TradeSim - a dedicated back testing platform and not just an after thought! 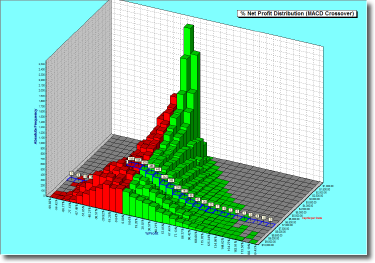 Most charting software does not include any back testing facility at all. The ones that do usually fall short when it comes to adequate testing and analysis capability. This is because charting software vendors put it in the "too hard basket" and disguise its absence by substituting it with a handful of "wiz-bang" trading indicators that they claim are winning trading strategies without actually proving it! How wrong could they be! Inadequate backtesting capability is like navigating a ship with a compass without a needle. TradeSim was built from the ground up without any compromise and peer. This is because it doesn't try to excel and perform poorly at a number of different tasks but rather concentrates all of its effort on a dedicated back testing platform and so is designed to excel at such. Advanced, Ultra Fast, True Portfolio System Testing for MetaStock with advanced Statistical Analysis ! 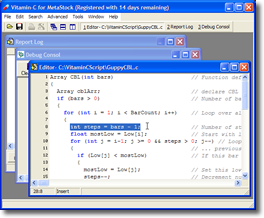 Write C/C++ code for MetaStock in minutes. No MDK, compilers or DLL's ! The Professional Edition of TradeSim is the second line up in our range of advanced system testing and development tools. 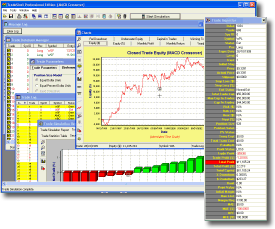 TradeSim is the first realistic true portfolio trading simulator and back tester available for Metastock. For the first time you can back test your trading system the way you would trade it and objectively analyze its performance without any of the limitations of single security or basket testers! Take the test. If you answer yes to any of the following questions then you need Vitamin-C for MetaStock ! Are you always being constrained by the limitations of the MetaStock formula language ? Do you often need to code the most simplest of things such as a profit or protective stop ? Do you need to reference a price value or date/time at a particular bar ? Do you need to code pattern matching routines ? Do you need to do some basic file manipulation ? Do you have problems using the MetaStock Developers Kit because it is to complicated and you wouldn't have a clue about writing DLL's ? Are you spending lots of time and money getting others to code stuff for you with complex MSFL code when you would like to be able to do it yourself ? Would like to have access to the language capabilties that the professionals use and be able to use it without a University degree or years of coding experience ? If you answered yes to any of the questions above then you need a dose of Vitamin-C for MetaStock ! Click here to learn more ! TradeSim® is a registered trademark of Compuvision Australia Pty Ltd. Metastock® is a registered trademark of Equis International. Windows® is a registered trademark of Microsoft Corporation.